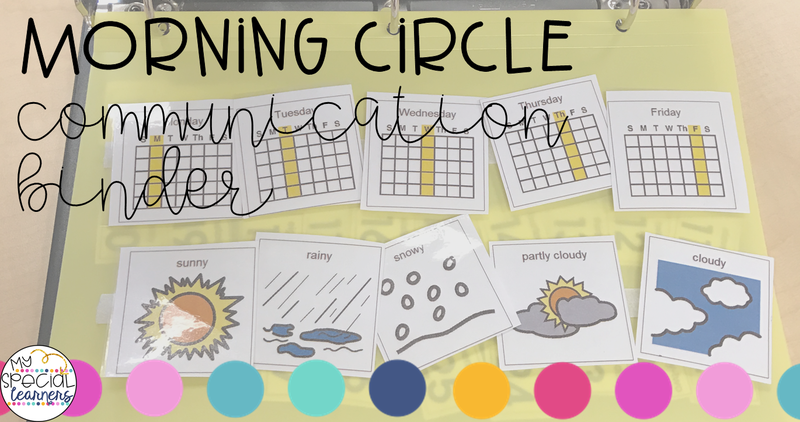 Do you have students who are non verbal or need help communicating information during morning circle? I had some students this year who needed some extra support to be able to fully participate in our circle time. 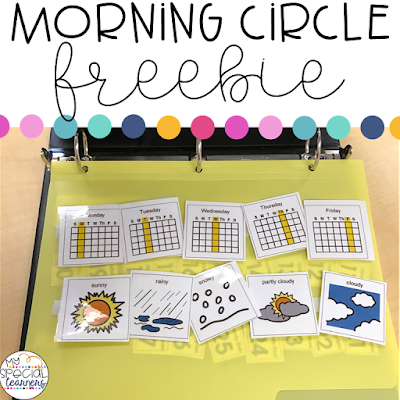 Out of this came: our morning circle time binder! I whipped up a binder with days of the week, dates, and weather to help my students answer questions during our morning group. We use Starfall calendar and check the weather on Accuweather each group time. For my students who needed assistance participating, they were either given 2 or 3 choices, depending on their ability. For students that were working on choosing from an array of 3, I would pull out the pieces from the inside of the binder and put them on the Velcro strip on the front just like this. They would either point to the number or give me the number, depending on the student. Some students would get an array of 2 choices if they needed less options to choose from. Again, the student would either touch the picture icon or take it off for me! On the inside, I had plastic file folders where I stored the pieces like this. It wasn't cute, but it was very functional! I would just place the binder with answer choices in front of the student that I wanted to tell me the day of the week, date, or weather that day! SO easy! Want to do this in your classroom next year?! I put together a freebie for you guys (and it's not boardmaker!). It's a little cuter than my version, but hopefully you will find it just as functional for you in the years to come! :) Click the photo below to download the freebie from Google Drive! I'd love to hear your feedback if you end up using this in your classroom next year! !